The release of the first Tegami Bachi DVDs will have two bonus animations included. Due out Dec. 22, the set will have two 2-3 minute long “Ura Tegami Bachi” episodes (Ura means rear, or in this case, hidden in Japanese). Also available will be a limited edition set which will include a box illustrated by manga creator Hiroyuki Asada. Check out the opening theme here: (Tegami Bachi). When I first saw the the opening pages of the manga Tegami Bachi, I was entranced by the dark blue images that graced the first few pages. Something about the color scheme and visual conception just jumped out from the get-go. Upon discovering that the whole series was set in a world of perpetual night, It immediately found its spot on my reading list (though, admittedly, it hasn’t reached the top yet, and remains to be read). So it was that I approached the anime version, thinking it to have infinite promise: A story reminiscent of the Pony Express, featuring messengers (letter bees) charged with delivering messages in a world of perpetual night. Which only added to the disappointment of the first episode. Oh sure, everything seems fine at first — a somewhat interesting main character, with an interesting job, meeting a mysterious boy who happens to be his next delivery. We seem set up for a fun show. Yes, Tegami Bachi is rife with cliches, and relies on a very formulaic set-up to get the story moving. A very artistic opening seen in the manga was replaced by a pretty standard Shonen plot and feel. Is that a bad thing? Not in-and-of itself. But there needs to be a spark of originality somewhere, something that makes a series interesting — and that spark hasn’t shown itself in the first episode. And in a show that seems ripe with creative potential, it seems something should have (or at least better) surface to set itself apart from the pack — because this fall’s loaded with too many big name series to afford being lost in the heap. The official Inuyasha Website has updating with a streaming 30-second promo for its latest anime, based on the last 21 manga volumes of the series. The series begins simulcasting this Saturday, Oct. 3. Find it: Here! Two new promos for the mixed media project Angel Beats! have been released, though still no actual animation. The project comes from Key, responsible for Air, Kannon and Clannad, Find promo video four and five Here! and Here! Also streaming on Youtube since last Friday, a promo for the live action film adaptation of the manga series Randys, The story is about a street fighter who starts a problem solving service named after baseball player Randy Bass. Check that out: Here! Last but not least, Cruchyroll has announced it will be simulcasting Tegami Bachi (Letter Bee, shown above) starting this weekend. Based on the manga series of the same name, Tegami Bachi is about a letter service in a world of perpetual night. Check out the promo video: Here! 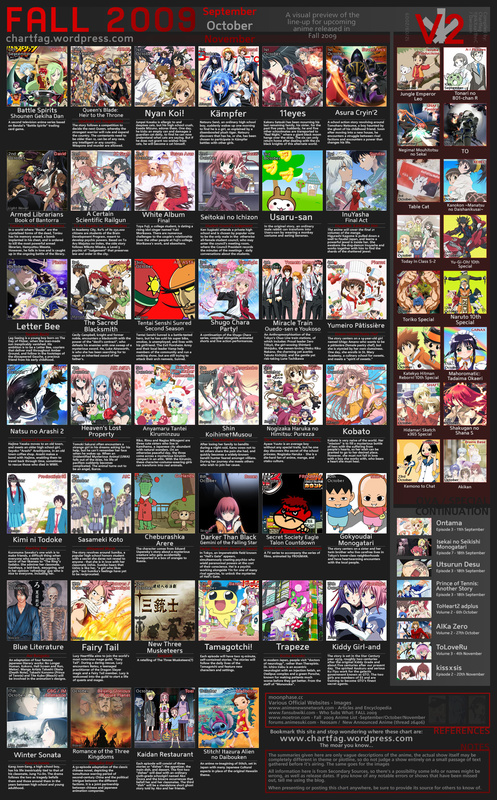 Once again the fine folks at Moonphase have put together a chart of the anime series debuting in fall. The list is huge, and amazingly most of the shows fall in October. Some big highlights include the newest Inuyasha anime, The Final Act, which wraps up the rest of the manga series; Fairy Tale, based on the excellent manga series; Letter Bee (Tegami Bachi); Kobato, based on the CLAMP manga; and Kiddy Girl-and, sequel to the sleeper hit Kiddy Grade. Also continuing are the To Love Ru OVA series, the Aika: Zero OVA series and Negima: Mou Hitotsu no Sekai. For the full list of upcoming anime, click: Here!